Hi friends! 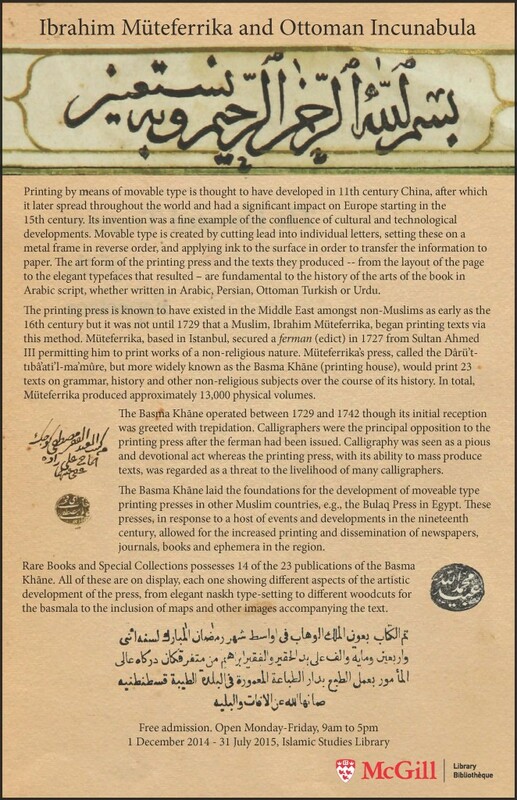 A new exhibition is now on display at the Islamic Studies Library. The exhibition celebrates Ibrahim Müteferrika and his early printed books. In honour of this week’s New Approaches to World Islamic and Middle East Studies workshop hosted by the Institute of Islamic Studies, the ISL has a special one week exhibition. Come one, come all! The Islamic Studies Library is currently displaying an exhibition featuring a fascinating selection of Arabic lithographed books from McGill Islamic Rare Books Collection. This Collection includes many examples of lithographed books in Arabic, Persian, Ottoman Turkish, and Urdu, dated from the eighteenth century until the mid-twentieth century. The Arabic lithographed books exhibition includes sixteen items encompassing the different periods, calligraphic styles, graphic designs, and publishing houses from the Muslim world and Europe. The physical exhibition is freely accessible in the Islamic Studies Library during opening hours from April 1st to September 30th 2014. In addition, all 16 items have been digitized, and are now accessible online. Let us know what you think! ʻĀmilī, Bahāʼ al-Dīn Muḥammad ibn Ḥusayn, 1547-1621. Kitāb Zubdat al-uṣūl. [Īrān : s.n., 1267 . Aṭṭafayyish, Muḥammad ibn Yūsuf, 1820 or 1821-1914. Risālah shāfiyah fī baʻd al-tawārīkh. [al-Jazāʼir] : [Bakīr ibn Qāsim al-Qarārī], 1299 [1881 or 1882]]. Bakrī, Abū al-Ḥasan Aḥmad ibn ʻAbd Allāh. Hādhā Kitāb Ghazwat al-Imām ʻAlī ibn Abī Ṭālib ; maʻa al-laʻīn al-Huḍām al-Ḥajjāfī li-sabʻ ḥuṣūn bi-al-tamām… [S.l. : s.n., 19–]. Fattanī, Muḥammad Ṭāhir, 1504 or 5-1578 or 9. Hādhā kitāb mubārak jāmiʻ li-kashf maṭālib al-āyāt wa-al-āthār wa-īḍāḥ maʻānī kitāb Allāh wa-aḥādīth Rasūlihi al-mukhtār Majmaʻ biḥār al-anwār fī gharāʼib al-tanzīl wa-laṭāʼif al-akhbār. Lakʹhnaw : Nawal Kishawr, 1283 . Ibn ʻArabshāh, Aḥmad ibn Muḥammad, 1392-1450. ʻAjāʾib al-maqdūr fī akhbār Tīmūr, al-maʻrūf bi-Taʾrīkh Tīmūr. Lāhūr : Maṭbaʻ Sarkārī, 1868. Ibn ʻĀṣim, Muḥammad ibn Muḥammad, 1359-1426. Ḥadāʼiq al-azāhīr fī mustaḥsan al-ajwibah wa-al-muḍḥikāt wa-al-ḥikam wa-al-amthāl wa-al-ḥikāyāt wa-al-nawādir. [Fez? : s.n., 19–]. Ibn ʻAzzūz, Muḥammad Makkī ibn Muṣṭafá, 1853 or 4-1915 or 16. al-Sayf al-rabbānī fī ʻunuq al-muʻtariḍ ʻalá al-Ghawth al-Jīlānī. Bambay : Maṭbaʻ Datt Parshād, 1313 [1895 or 1896]. Ikhwān al-Ṣafāʼ.Risālah min rasāʼil Ikhwān al-Ṣafāʼ wa-khullān al-murūwah wa-al-wafāʼ : qad ishtamalat ʻalá mā dāra bayna al-ins wa-al-ḥayawānāt min al-munāẓarah al-murattabah ʻalá badāʼiʻ al-aqwāl wa-al-mukhāṣamāt / bi-idārah Muḥammad ʻAbd al-Wāḥid. Kānfūr : Maṭbaʻah al-Intiẓāmī 1894. Iṣṭakhrī, Ibrāhīm ibn Muḥammad, 957 or 8. Kitāb al-Aqālīm. Gothae : In Libraria Beckeriana, 1839. Jawwānī, Muḥammad ibn Asʻad, 1131-1192. al-Shajarah al-Muḥammadīyah.[Istanbul?] : Maṭbaʻat Muḥammad wa-Burhān al-Dīn, 1331 . Jazāʾirī, Niʻmat Allāh ibn ʻAbd Allāh, 1640 or 41-1701. Nūr al-anwār fī sharḥ al-Ṣaḥīfah al-Sajjādīyah. [Tehran : s.n. ], 1316-1317 [1898 or 1899]. Jazūlī, Muḥammad ibn Sulaymān, d. 1465. Dalāʼil al-khayrāt ; wa-yalīhi qaṣīdat al-Burdah wa-qaṣīdat al-Munfarijah wa-bi-hāmishihi majmuʻat al-awrād wa-al-aḥzāb wa-al-adʻīyah. [Istānbūl?] : al-Maṭbaʻah al-ʻUthmānīyah, 1302 . Qazwīnī, Ibrāhīm ibn Muḥammad Bāqir, 1799 or 1800-1847 or 8. [Ḍawābiṭ al-uṣūl]. [Tehran? : s.n. ], 1271 [1854 or 1855]. Tūnisī, Muḥammad ibn ʻUmar. Hādhā kitāb Tashhīdh al-adhhān bi-sīrat bilād al-ʻArab wa-al-Sūdān. Paris Duprat, 1850. Walī Allāh al-Dihlawī, 1702 or 3-1762 or 3. Fatḥ al-khabīr. Lak hanaʼu : Munshī Nawal Kishūr, 1314 [1896 or 1897]. Yūsī, al-Ḥasan ibn Masʻūd, 1630 or 1631-1691. Qānūn yashtamilu ʻalá aḥkām al-ʻilm wa-aḥkām al-ʻālim wa-al-mutaʻallim wa-mā yataʻallaqu bi-shayʼ min dhālika ʻalá wajh al-ishārah. [Fès] : ʻAlá dhimmat al-ʻArabī al-Azraq, 1310 [1892 or 1893]. Hi friends! If you missed the beautiful exhibition, curated by Adam Gacek you now have the opportunity to view the accompanying catalogue: Strokes and Hairlines. Enjoy!! 2 years ago the McLennan Library was home to an exhibition on the scholar, al-Ghazālī. The exhibition was well received and was accompanied by postcards and a booklet. The booklet includes articles by current Director of the Institute of Islamic Studies, Dr. J. Ragep, past-Director Dr. R. Wisnovsky, Ghazālī scholar Rev. Dr. Y. Said, and PhD. candidates E. van Lit and E. Tasbihi. It also provides details on the most important and unique leaves and manuscripts that were on display. 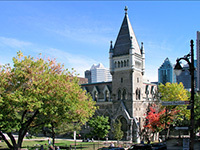 Recently, this catalogue became available for free thanks in large part to the Digital Team of McGill University Libraries. The Islamic Studies Library (ISL) was founded in 1952 in conjunction with the Institute of Islamic Studies (IIS). Dr. W.C. Smith, founder and first Director of the IIS sought to give greater definition to the field of Islamic studies. The library has grown from a collection of 250 books to 125,000 volumes. On display are some of the treasures from its collection and history. For example in 1959 the former President of Tunisia, Habib Bourghuiba visited the IIS and ISL and donated a Qur’ānic leaf, in 1971 the former Shah of Iran sent a personal invitation to then Director of the IIS, Dr. Charles J. Adams. We also have on display one volume from the complete holdings of the journal of al-Azhar in Cairo. Dr. W.C. Smith’s Ph.D. dissertation was an analysis of these publications. Hi friends! Next week is filled with delightful activities sure to engage you and teach you about various aspects of Islamic civilization and culture! On Monday 11 Feb. a new exhibition celebrating McGill’s rich Islamic manuscripts will open followed by a lecture by Adam Gacek, curator of the exhibition, on Arabic paleography! Two other not-to-be-missed events are Turkish calligrapher, Hilal Kazan’s workshops and Chinese calligrapher Haji Noor Deen workshops! Come one, come all! All of these fantastic events are detailed here. Hi friends! As part of the 60th anniversary celebration, the exhibition “Strokes and Hairlines: Elegant Writing and its Place in Muslim Book Culture” curated by Adam Gacek will open on the 11th of Feb. in McLennan library. On the 13th of Feb. Mr. Gacek will provide a lecture on Islamic manuscripts. Come one, come all! For further details check the the 60th anniversary website. Hi friends! In addition to the newly curated exhibition celebrating Book Culture in the Mediterranean, there will be a short presentation followed by a wine and cheese reception. The event will take place on Wednesday 28 November, for the McGill Medievalists second annual rare books workshop. Last year our workshop on medical manuscripts in the Osler Library of the History of Medicine was very well attended. This year, Cecily Hilsdale (McGill, Art History and Communication Studies), Jennifer Garland (McGill, Liaison Librarian, Art History and Communication Studies), and Sean Swanick (Liaison Librarian, Islamic Studies) will lead us in a viewing of the exhibition: “Book Culture in the Medieval Mediterranean”. We will meet at 5:30 pm (slightly later than normal) on the 4th floor of McGill’s McLennan Library (the location of Rare Books and Special Collections). A wine and cheese reception will follow.